Two must-have habits you’ll need to elevate your value. It's common knowledge to say that company culture is at the heart of the success of every organization. The way in which your team interacts within itself heavily influences and determines how they will interact with your customers. However, as individuals we have the responsibility to not sit back and wait for leadership to spoon feed us on how to behave. 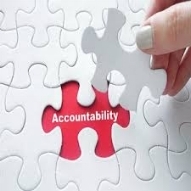 As individuals we must have integrity and personal accountability in regards to our behaviors and standards if we want to succeed and elevate our value. Choose to "show up" for your own personal dignity and sense of integrity. Integrity is doing the right thing when no-one is watching. Doing and giving your best is always the right thing to do. Your personal accountability and integrity will create positive ripples, making you a leader by example and setting the tone for others to be inspired by. Behaviors and attitudes are contagious regardless of how high or low we find ourselves on the social food chain. We can elevate or deflate. It's a choice regardless of circumstance. Washing dishes neither held me back nor allowed me to lower my standards. I was neither ashamed nor did I lose motivation or belief. I still held myself accountable to deliver results with pride and dignity. I set a personal challenge and goal to be the best dish washer in town despite hating the job. Accountability is not always easy. Integrity is easily compromised. Make it a habit to always deliver the best of you. Commit to being extraordinary. Always choose to SHOW UP. Elevate your value. Consistency transforms action into habits and habits determine who you will or won't become. Stay focused and committed because that approach will influence, overlap and benefit you in all aspects of your life, empowering you to spread your wings and fly without a net. Optimize your team performance with these 7 steps. It's never easy to keep your team focused, motivated and performing at optimum capacity. Flat-lining at some point seems to be inevitable. How can you prevent this ailment that costs the US economy up to $550 BILLION annually in lost productivity? More simply than you think. Humans tend to flat-line when they become board and uninspired, be it at work or life in general. The sense of excitement and passion withers away through repetition and monotony. Corporate bureaucracy, leadership and culture are the guilty parties. Rigid corporate strategies, rules and tradition tend to stifle passion and motivation by slowing down the process of inviting and embracing the new, the different. 1. DISRUPTIVE LEADERSHIP: The number 1 killer of innovation and employee engagement are controlling managers, rigid SOP's, un-defined cultures, and outdated strategies... "It's how we've always done it". By continually repeating yesterday's success formula, we plant the seeds of stagnation. Everybody within that static culture will disconnect from their original "why" and lose the growth mindset that keeps successful companies relevant and competitive. You risk inviting them to perform on auto-pilot. Keep them on their toes by consistently challenging them. Leadership must invite and inspire change. Without being challenged we stagnate, GET BORED, become complacent. The challenge is not in the form of peer rivalry and comparison, but rather healthy competition whereby they mutually encourage and elevate each other's game. Challenge your team by inviting them to find a solution to a problem - allow them to flex their creativity and decision-making muscles. Empower them with added responsibility. Empower them by encouraging them to express themselves and in turn listening to their ideas, suggestions and solutions. Once you've inspired and empowered your team, get out of their way, relax and enjoy their success. 2. PERSONAL DREAMS: Also, connect their personal aspirations/dreams to the workplace so they evolve as individuals within your company - yes, you risk losing them as they pursue their own goals - but on the flip-side, do you really want their unmotivated and disengaged persona to stay and contaminate your culture, your brand and your customer base? 3. AUTONOMY and INCLUSION: When you relinquish the reins and trust them with a project or the added responsibility, that project will feel like they own it. Ownership is powerful. They will carry that responsibility with pride because it belongs to them. They will nurture it like their own baby, filled with love, understanding, purpose, joy, commitment, passion, and fulfillment. 4. COMFORT ZONE: Make sure that the challenge is not overwhelming, intimidating or simply beyond their ability - it will trigger a fight, flight or freeze response. However, definitely push them beyond their comfort zones. Give them the gift of control. Get management out of their flight path - take away the roadmap. Let them figure out what the destination is and how to get there. Offer support and resources when necessary. Sit back, watch them grow and fly without a net. 5. OBLITERATE THE BOX: As a former Cirque du Soleil performer, team captain and recently as a consultant and facilitator for their newly created corporate training platform called CIRQUE SPARK sessions, I learned many invaluable lessons from Cirque's philosophy. They constantly push themselves and their team members - they encouraged us to extend our vision beyond the existing horizon and ignore the limitations of the proverbial box. 6. RISK | EXPLORATION | FAILURE: The side effect is the exploration and discovery of so many more options and possibilities. The freedom with which Cirque gifted its performers, allowed us to spread our wings, thrive and FLY WITHOUT A NET. They encouraged creativity: expression, exploration, risk-taking, and failure as an option. But without providing us the appropriate leadership, environment, tools and liberty (void of anarchy and chaos), we would flatline, become disconnected, and lose our passion, drive and commitment to excellence. This philosophy of empowerment inspired us to explore, learn, grow in confidence, and remain focused and committed to maintaining and enhancing the expected Customer Experience that is synonymous with the Cirque du Soleil brand. 7. FUN: Bring it all together in an environment and culture that is fun. We learn more when having fun and are more receptive to change, growth and responsibility. Companies with fun, happy cultures experience on average 20% higher profits with elevated retention numbers. If this blog was of value, please feel welcome to comment, steal, borrow and share. Is motivation an empty promise. Ironically, I am considered or called a motivational speaker. I've never liked that label. As a speaker and trainer, I only INSPIRE action or change. CNN legal and social commentator and "motivational" speaker, Mel Robbins, gives a great talk on this topic. mo·ti·va·tion ˌmōdəˈvāSH(ə)n/noun: the reason or reasons one has for acting or behaving in a particular way. Motivation is not an external force. It is an internal desire, hunger or need to change something. The only "motivation" you can gift a person is to empower them with confidence and belief or hope that they can do or achieve something because they have the tools or the potential. If this blog was of value, please feel welcome to comment, steal, borrow or share. Strong leaders build happy, focused and inspired teams that are committed to elevate the CUSTOMER EXPERIENCE by delivering on the brand promise and living up to the expectations and needs of the modern consumer. The leadership paradigm has shifted. We’re becoming a networking society where collaboration is key, innovation essential, heightened customer experience a must, and responsibility belonging to many individuals, not just one. There is so much more to leadership today than power and having people follow you. The ultimate purpose and objective of great leaders is to instill belief, hope, direction and inspire greatness from colleagues and employees. Love and respect should be the driving force behind leadership, resulting in enhanced company culture, motivated and engaged employees hungry to give, deliver and achieve. We have all experienced at one point in our careers a bad boss! The boss who disrespected us, bullied us, harassed us, was indifferent, rude, belittling or simply didn’t like us. It heavily affected our performance. Maybe you took a few more sick days off as a result. Some of you became less effective or focused on the job. Perhaps your attitude became negative and contagious? Did you become more confrontational, indifferent or even a bad employee? These are typical symptoms of the unhappy disengaged employee and it costs businesses not only dollars in lost productivity, but heavily impacts customer experience and the reputation of a brand. It only takes one bad manager or boss to cause a chain reaction within your culture. 1 in 2 employees are not happy at work - Gallup survey of 25 million employees, part time and full time, in 189 different countries. To optimize team dynamics it's crucial to have a solid culture that allows employees, if not invites them to thrive. Leadership must constantly and respectfully reinforce that culture and inspire the team to excel and expand. Too many companies allow bad bosses to remain in positions of management or leadership without fully realizing the negative impact is has on their bottom line! Sometimes it's a reflection of the CEO or executive leadership and culture they establish by example. As leaders it's wise to frequently self evaluate and make sure you are not the bad boss that makes people quit. Be the boss that inspires greatness. Lead to empower not to have power. "IF YOUR ACTIONS INSPIRE OTHERS TO DREAM MORE, LEARN MORE, DO MORE, AND BECOME MORE, YOU ARE A LEADER." - John Quincy Adams.